custom-airbrushing and automated booth technology. Tanning Bar, you will get perfection. 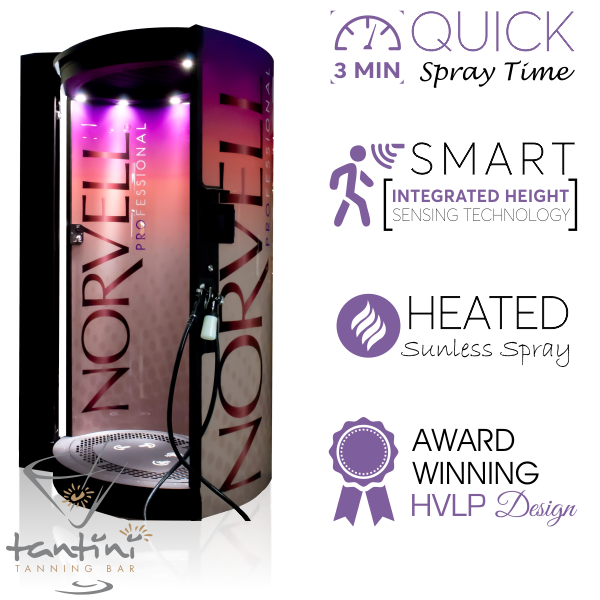 Uses the worlds #1 most requested solution formulation: Norvell® Award Winning Professional Sunless Solution. Norvell® iNTELLiSPRAY™ solution is formulated to work across a wide spectrum of skin tones, creating a customized shade for each client. No orange and virtually no unpleasant ‘sunless tan’ odor. Heated environment activates the DHA and allows a warm, comfortable spray session while eliminating drying time in the booth. Robotic, hand-held simulated spray arm for more precise application. Infrared sensors scan body parameters for an individualized spray session. Automated voice commands guide clients through two easy positions. Simply face front, then face back. No complicated positions needed. Down-draft technology works with gravity pulling any excess spray downward, for a fog-free spray session with extremely limited inhalation of overspray. Intelligent Sunless Spray, just got smarter. 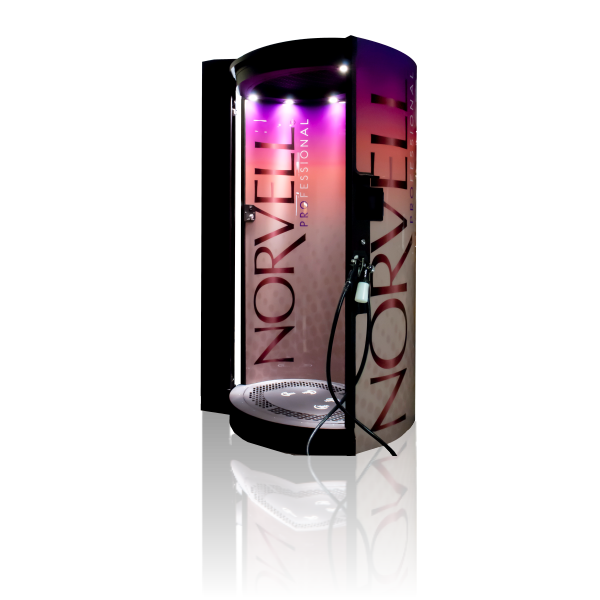 Introducing the Norvell Auto Revolution Plus, an HVLP sunless spray tan booth that is out of this world. Do you have questions about sunless tanning and solutions? We have your answers. Airbrush Sunless Spray Tanning is a customized spray tanning session applied by a trained technician. An Airbrush technician can help hide unwanted tan lines and provide clients with a flawless spray tan. Appointments are required. Our Tans will last anywhere from 7-10 days, on average. The amount of physical activity, after care, and proper preparation for the tan are all factors of how many days one can expect their tan to last. Our solution will react naturally with each specific skin tone. The technicians will custom blend a formulation specific to each client’s natural base colour. However, if it is your first time tanning, or you have an extremely fair complexion, we suggest choosing a lighter tone to ensure satisfaction. Very fair complexed individuals may require a follow up session 12-24 hours later. Spray tanning is the finishing touch to months in the gym and the final step (next to hair and make up) before going on stage. READY! SET! STAGE! Not all tans are equal and stage lighting will wash you out and may not do chiseled muscles the justice they deserve. The darker the tan, the tanner you will appear under the bright stage lights. Your competition tan will look different under natural, indoor and stage lighting. How do you achieve a dark rich sunless tan? We offer competition spray tans in our salons AND COMING SOON TO COMPETITIONS NEAR YOU. Appointments are necessary with at least two days notice. Schedule your appointment today and GOOD LUCK! Call the professionals with the professional solution!